Charming Cabin Mountain Getaway in Tahoe Donner! 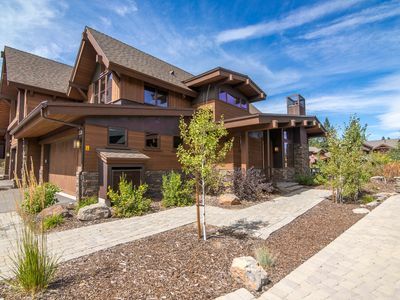 Outdoor enthusiasts will be in awe of this beautiful Truckee vacation rental cabin in the Sierra Nevada mountain range. 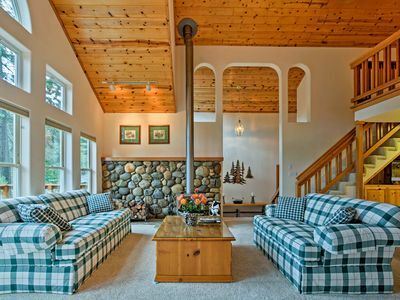 Your family will fit perfectly in this 3-bedroom, 2-bathroom home that sleeps 8. 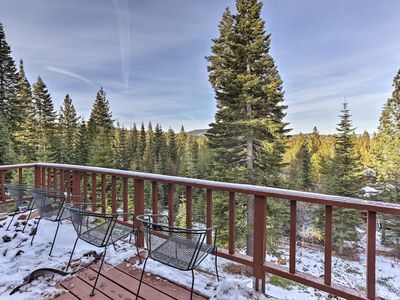 Truckee is a historic town has an unreal backyard filled with opportunities to get in touch with nature, your athletic side, and the skier in you. 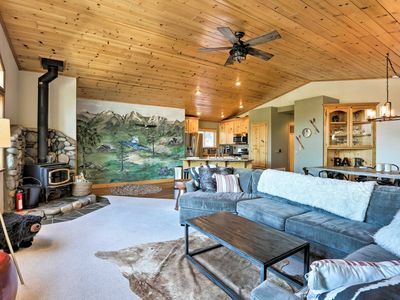 With plenty of adrenaline-pumping activities to fill your day, you'll be ready to head back to the cabin and relax by the fire. 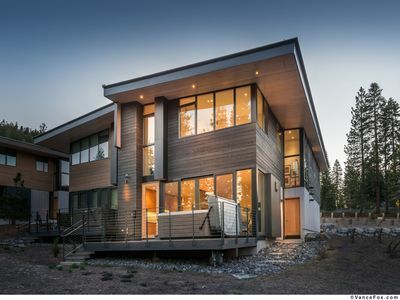 The beauty of this wood cabin in the Tahoe Donner Association is amplified by the surrounding lush foliage, and the interior is just as picturesque. 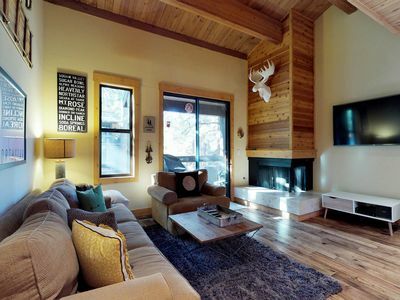 The wood accents throughout the home, amazing ivory carpets lining each room, and mountain decor will make you feel right at home. 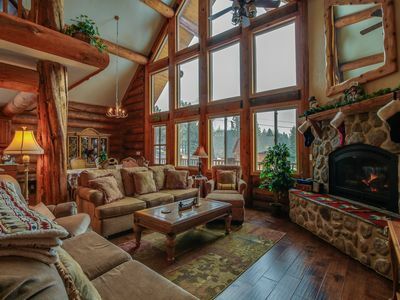 The living room is filled with natural light streaming through the wall of windows that lead to the furnished front porch. 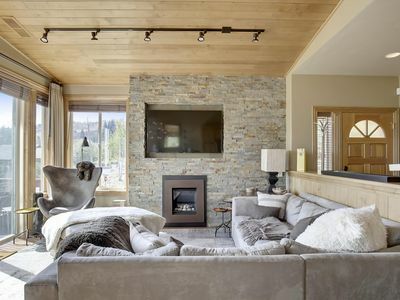 The light wood ceiling, checker couches, and the immaculate stone-lined wood burning fireplace give the living space a modern mountain vibe. Take your shoes off, put your feet up, and watch your favorite show on the flat-screen Smart TV with an Amazon Firestick. 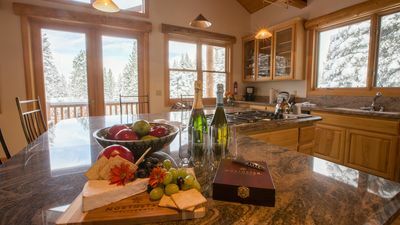 Once you're feeling recharged, head to the fully equipped kitchen and make some homemade trail mix to bring on all of your Truckee excursions! 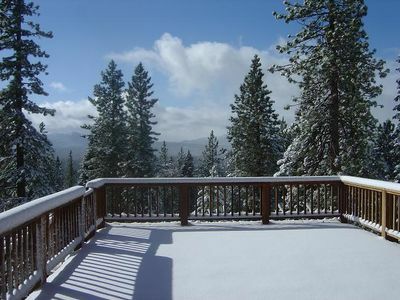 The cabin is located in Tahoe Donner, one of the largest homeowner associations in America. 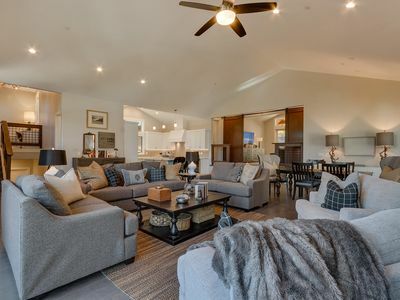 With that comes amenities that you can access such as beach clubs, campgrounds, golf, tennis, trails, dining options, camps, fitness classes, and much more! 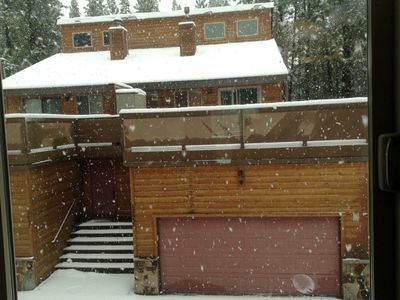 The winter is an obvious draw for a lot of travelers because Truckee is close to some world-class ski resorts, like Northstar California Resort, Sugar Bowl Resort, and Tahoe Donner Downhill Ski Area. Hit the slopes, participate in some apres ski, then grab some food at any of the amazing restaurants in downtown Truckee. 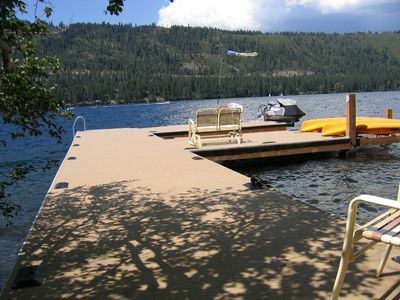 Summer is an energized time in Truckee! 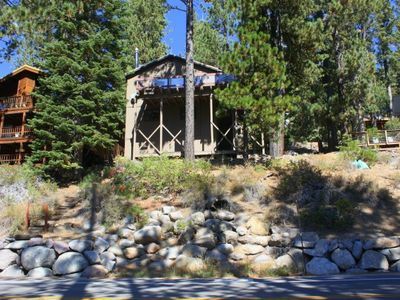 Make your way 9 miles to Donner Lake for water sports, fly fishing, and fun-in-the-sun. 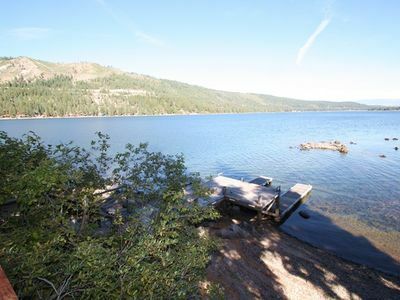 Lake Tahoe is only 12 miles from the cabin and is definitely worth spending a day paddle boarding or kayaking on the calm crystal clear waters, walking along the beaches, and appreciating Mother Nature's amazing creation. 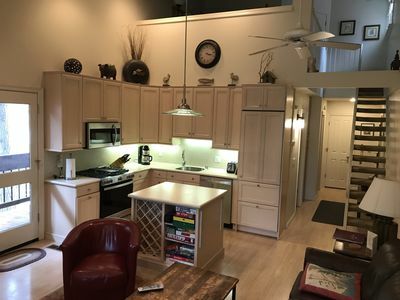 - Kitchen amenities include spices, herbs, seasonings, oils, balsamic vinegar, red wine vinegar, waffle maker, fondue set, blender, handheld mixer, bakeware, garlic press, citrus press, and more! 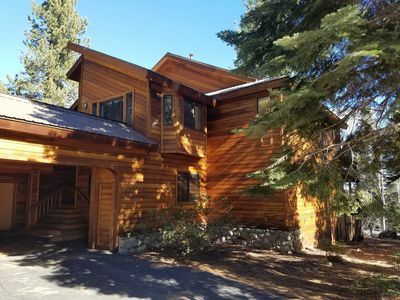 - There is so much to do you'll have to extend your stay when you vacation at this beautiful cabin in the Tahoe Donner Association in Truckee! 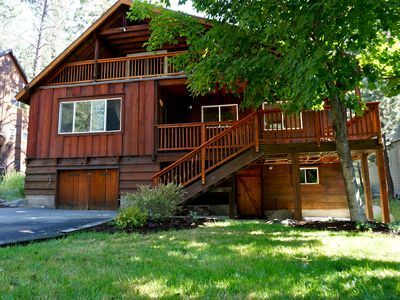 - We would like to welcome you to our first vacation home in Tahoe. 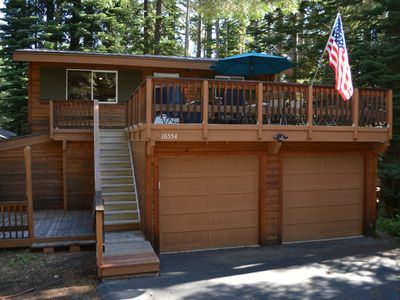 We are looking to share our home with other responsible families to explore and enjoy what Tahoe has to offer. The house will have almost everything you need (bath items, too many spices, a brand new BBQ, a huge TV and more) since we are there when you are not. So pack your bags, come to play and make yourself at home! 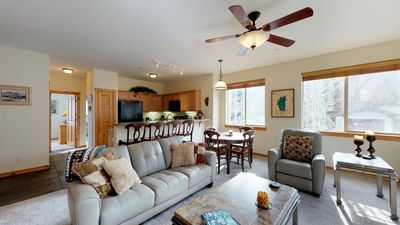 Boulders Condo, Easy Access to Everything with Amenities! 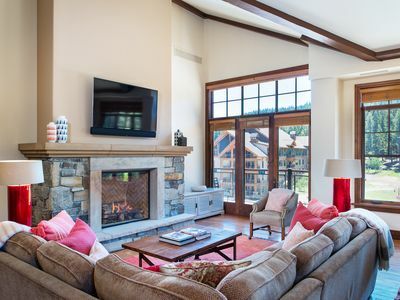 Gorgeous Tahoe Donner Condo with views!